“The last is the best,” remarked my old friend and spiritual supporter at the end of a four-month group exploration on the path of contemplation. If this “best” was a grace, a true feeling brought forth by the Holy Spirit, how did it taste like? Like a curious student, I wanted to sit with God, to see more, to feel more and to find out more. To contemplate, in Monty’s interpretation, is to spend time with. If so, how did I interpret this four-month experience inwardly? Could I feel that sense of time that moved from chronos to kairos, from ordinary time to revelatory time1? What was meant by contemplation in this experience to me? How did this first-time experience help me in moving forward? What had been the challenges and graces? What was the greatest gift I discovered? If contemplation leads to temptation, what were the temptations emerged that urged me to be less than who I was2? I need not have worried. Somehow the Lord understood my personal spiritual need and path more than anyone else. The eight-day retreat I signed in way earlier provided me a great deal of room to contemplate this special journey of mine. After a few days of discernment with my spiritual director, this curious me was invited to enter the gospel scene of Cana wedding, only to be more astounded at the way Jesus and Mary revealed to me over their mother-to-son dialogue. In my imaginative prayer, Mary noticed that the wine ran short, and that it was impossible to refill in a short time. The guests would be very much disappointed, she thought. She could not do anything about it, but believed that her son, a guest too in the banquet, could give a helping hand. With this intention in mind, she whispered to her son, saying tenderly, “They have no wine,” then letting him decide for himself his next move. With great patience and attention, Jesus was listening to his mother and at the same time discerning the will of God. All the while, I was listening deeply to the way Jesus unveiled more of the scenario. He knew “his hour has not yet come” and yet, he was touched by his mother’s way of caring her neighbors and friends. A compassionate and loving person as she was must have had some good reasons behind the invitation. These fours words reverberated in me as my mind went back to the very start of the contemplation workshops. I did recognize a “need,” a desire, a possible road that could lead us to the mountain where we could meet God in a deeper way. What if we attempted to take that path and opened it up for those who wanted to walk along too? Even if I recognized the need of opening contemplation workshops, I could not have moved on without my spiritual companions who discerned with me and encouraged me to run with the idea. I took the first step, made effort to stay on course and moved on despite the clouds of desolation that came my way. It was not a solo action. The Lord had been watching over. He only needed me to keep on being attentive to the very end and to witness the transformation from its opaqueness to transparency if I let the picture unfold to me. Towards the end of the wedding scene in Cana, Jesus continued to tell me the exhilarating feelings of the guests after they tasted the water that had become wine. The headwaiter said, “Everyone serves good wine first, and then when people have drunk freely, an inferior one; but you have kept the good wine until now” (John 2: 10). In looking back at the last contemplation workshop, we did have a taste of that good wine — surprise, sweetness and satisfaction dipped in pure aroma of joy. We felt like we got more immersed in the Christ who unified us in the sacred space of silence and sharing. 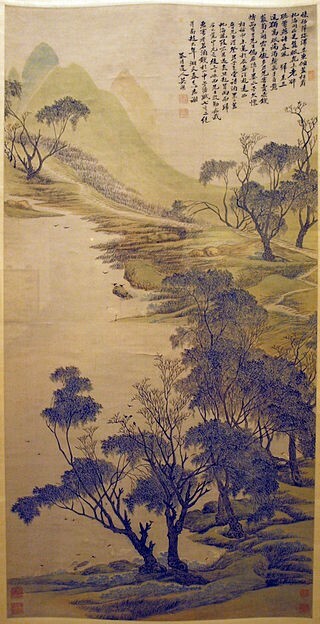 The “Spring Scene of Lake and Sky” (湖天春色圖) painted by Wu Li was not remote to me any longer. He painted such a beautiful hanging scroll and composed a poem with an inscription that depicted the visit. It was said that he must have felt solidarity with Mr. Chouhan and Fr. Rougemont who represented a kind of spiritual emancipation. 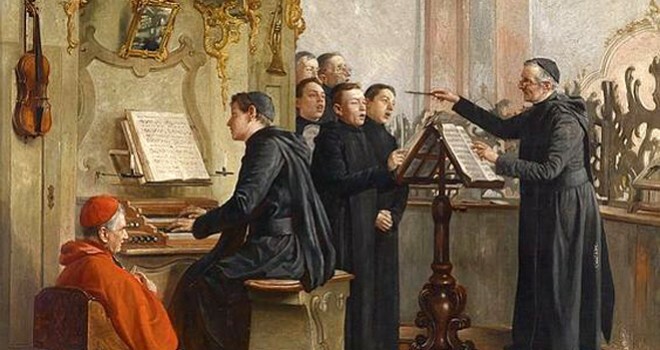 What I see now is another unique and beautiful painting made by each one of us who, like Wu Li, Father Rougemont and Mr. Chouhan, have been enlightened and transformed through a quiet gathering on the first Advent Sunday. We contemplated God and kept looking at God. Now did we end up looking with the eyes of God?